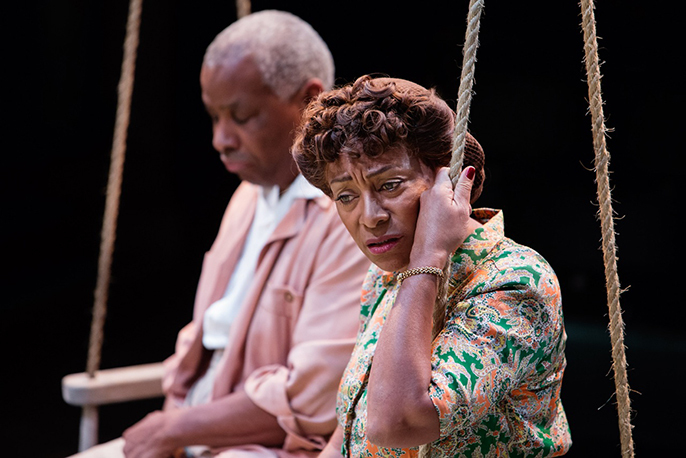 Talawa’s critically acclaimed production of Arthur Miller’s ALL MY SONS, directed by Artistic Director Michael Buffong will set out on a UK tour in February 2015, in the centenary year of Miller’s birth. The production played to full houses and standing ovations when it opened in a co-production with Royal ExchangeTheatre, Manchester last year and will now open at the New Wolsey Theatre, Ipswich onThursday 12 February 2015 then tour toCambridge Arts Theatre, Salisbury Playhouse, Watford Palace Theatre, Oxford Playhouse, Birmingham Repertory Theatre, Richmond Theatre, Mercury Theatre Colchester and MalvernTheatres. Ray Shell and Doña Croll lead the cast in this searing investigation of honesty, guilt and the corrupting power of greed. One hundred years after Arthur Miller’s birth, it is still very clear why All My Sons, Miller’sfirst major success, established him as one of the greatest dramatists of the 20th Century. 1947. Joe and Kate Keller, an all-American couple, are living with the ghosts of World War II. The full cast includes Kemi Bo-Jacobs (Ann Deever), Doña Croll (Kate Keller), Andrea Davy (Sue Bayliss), Ashley Gerlach (George Deever), Bethan Mary James (Lydia Lubey), Leemore Marrett Jr (Chris Keller), Ray Shell (Joe Keller) and Chinna Wodu (Frank Lubey).